I was trying to make cannoli. Turns out this particular pastry dough puffs up more than I expected when it’s fried. So I had these poofy cannoli shells, which were way too rich for the cannoli filling. Turns out, coating them with powdered sugar makes them taste like beignets. So I’ve been playing with this recipe for a week now. It’s based off the croissant recipe I got from Gluten Free Gobsmacked. Mix up the dough, roll it out or shape it by hand. If you’re rolling it out, make sure to flour your surface and the rolling pin. Then cut it into rectangles (or whatever shape you want). I used a sauce pan for the frying, since it has high sides and contains the oil spatter better. You want the frying oil at least an inch deep. I’ve used toasted pistachio oil (which was awesome) and grapeseed oil. Heat the oil on medium until it’s hot enough to fry the dough (I use a small test piece of dough to be certain). Then start frying up the pieces of dough. You’ll want to flip the dough over once the bottom portion has turned golden brown. Remove it once both sides are golden brown and place it on a cooling rack covered with paper towels; the paper towels absorb any excess oil. 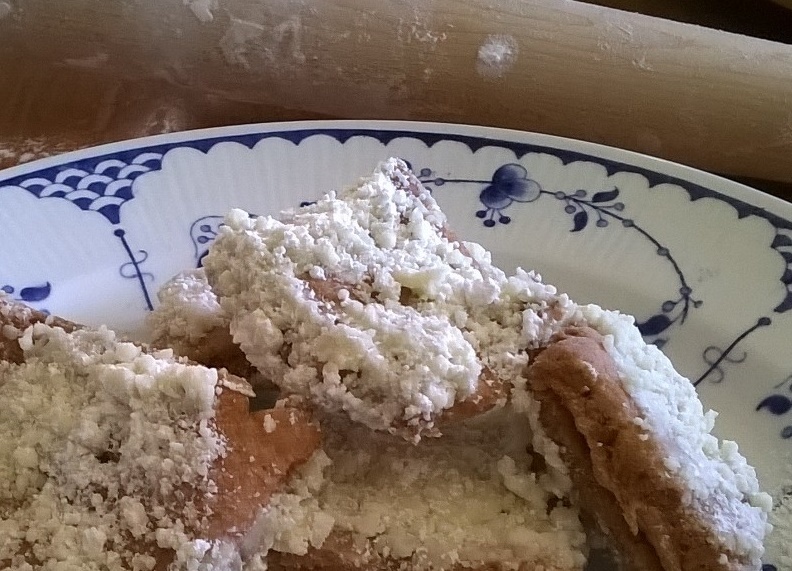 Use a baking dish (bowl or plate or whatever) filled with powdered sugar to coat the beignets. This seems to work best while they’re quite warm, but not too hot to touch. Coat one side and then flip them over. Or sift more powdered sugar on top. If you roll the dough thinner and add cinnamon to the powdered sugar, they’re not far off from churros. 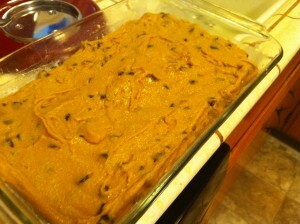 *I used Glutino/Gluten Free Pantry’s all purpose flour mix. Accidental Brownies — Gluten Free! I accidentally made brownies the other day… My ex had just brought all my stuff over, so I was feeling like being a bit self indulgent and decided to make frosting… and failed. Which is ridiculous, because making frosting is easy. But between using a new cocoa powder and overwhipping the butter… the frosting looked more like brownie mix than frosting. And I figured, well, why not? So I added a few things… and the brownies were awesome. They had a chewy top and corners, but a very soft and rich center. Reminded me of the Ghirardelli mix I used to make in the days of gluten. 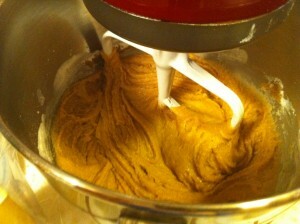 Mix butter, cocoa powder, powdered sugar, and vanilla together in food processor or stand mixer. *”Less than a box of powdered sugar” is my favorite instruction ever from my mom. It usually translates to 3/4 of a box. Healthy Gluten-Free Cooking: 150 Recipes for Food Lovers – This one is from the Ballymaloe Cooking School in Ireland, and I stumbled across it when I was searching for an Irish Soda Bread recipe. Every recipe I’ve tried from this book has been a success. The Irish Soda Bread recipe is wonderful. Gluten-Free Baking Classics – The title says it. This book gives you a great and simple overview of how gluten free flours work, where to find them, and what other things (like, say, xanthan gum) you’ll want to have on hand. The Gluten-Free Almond Flour Cookbook – Tons of great recipes in here that work not only for celiacs, but also for anyone on a low carb diet. If you sub honey in place of agave nectar, you can adapt many of these recipes for SCD, too. It would also probably work well for paleo diet folks. (The author has recently gone paleo, and she has a website with tons of additional recipes). 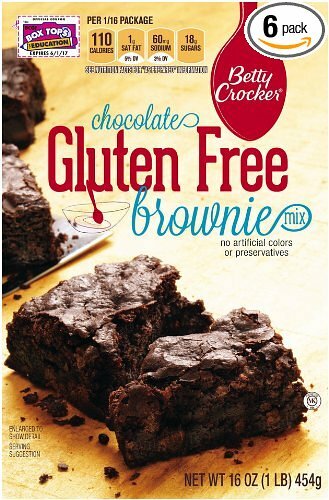 The Cake Mix Doctor Bakes Gluten-Free – Confession, I don’t own this one. I own the original gluten-full version, but lordy do I lust after this one. It has great ratings on Amazon (4.5 stars from over 50 reviews). The original was wonderful and it looks like this one will be, too. Breaking the Vicious Cycle: Intestinal Health Through Diet – This book is the bible of SCD, and it’s a good one. It’s not aimed specifically at celiacs (although the diet was originally developed to treat celiac disease) but it has great recipes. The pizza crust in this one remains my absolute favorite of the various recipes and mixes I’ve tried. Five great books, and there are dozens more waiting to be discovered or written. But this is a good place to start. Blondies are kinda a cross between a chocolate chip cookie and a brownie. Some recipes call for coconut (no thanks) or dried fruit (why?) but the best (in my opinion) is just plain chocolate chip. 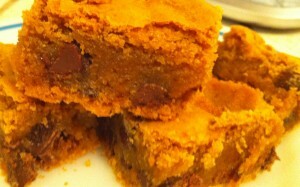 Chocolate chip cookie + brownie = awesome. I snagged the recipe from Gluten Free Betty (highly recommend you check out her site). 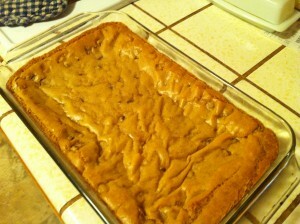 The main difference is that I baked the blondies by about 10 minutes less than she did. 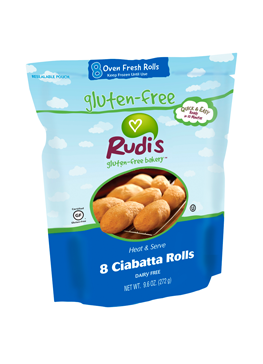 I find that with gluten free stuff, I really want to encourage the gooey elements since gluten free baked goods tend to dry out and go stale rather quickly. *You can use whichever gluten free flour mix you prefer, just be careful if there’s already xanthan gum or baking soda/powder in your mix and adjust accordingly. 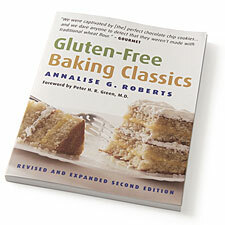 The original recipe calls for the mix from Gluten Free Baking Classics by Analise Roberts, which is excellent. I’ve also used this mix from Gluten Free Gobsmacked. Both work well, but I find I can’t handle the corn starch in the latter anymore. Be careful to get a finely ground rice flour for whichever mix you make. The first time round I used too gritty a grind (Arrowhead Mills, while often wonderful, has too coarse a grind of white rice flour for my preference. Left me feeling like I had a mouthful of sand. Tasty sand, but sand nonetheless.) Second time around, I used Bob’s Red Mill Brown Rice Flour, which was finer ground and much better. 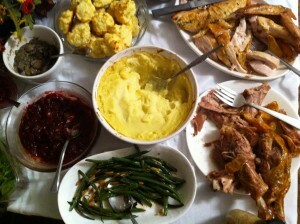 Sim and I took over making the Thanksgiving meal this year, since my mom is still sick after the chemo. It was an herculean task, but we managed to pull it off. It was also nearly gluten free. My mother did make some gluten-full stuffing, which she very carefully kept segregated away from everything Sim and I were making so as to avoid contamination. Good Amazon deals going on for those of us who need to bake at home. Most of these should be going on Fri-Monday (you know, the whole Black Friday – Cyber Monday thing). KitchenAid Professional 600 Series 6-Quart Stand Mixer – $499 down to $299 plus a $50 rebate = $249. If you’re thinking of getting one, this is a good deal. 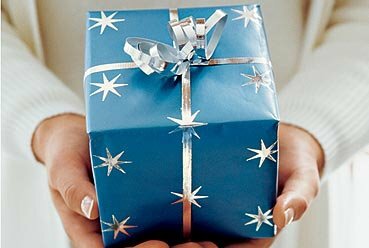 Just remember to mail in the rebate forms. KitchenAid Artisan Series 5-Quart Mixer, White or Black – $349 down to $233 plus a $30 rebate = $203. This is the same model I have in my kitchen, just a different color. Except I got mine at $249 a year ago. This is a very good deal. All of the colors are on sale, but only Black and White are this low. Again, you need to mail in rebate forms. Always mail in your rebate forms. Pamela’s Amazing Bread Mix, 25-Pound Bag – $48 on Amazon Warehouse. Down from $55 earlier in the week. Going for $69 on the regular Amazon site. If you’re a Pamela fan, this is a great deal. That’s less than $2 a pound. Rare in gluten free mixes. What to do With Whey? Currently draining store-bought greek yogurt so as to make more yogurt ice cream (with a friend who was excited after having a spoon from the last batch and wanted to try making some). This means that I’m left with about a cup or so of whey. And I’m trying to figure out what to do with it. I’ve heard that it can be used in baking, but I don’t know how… And that it can be used to make ricotta, although I’m guessing 1 cup isn’t enough to make much. I’d hate to let it go to waste. I am crazy busy today so instead of a detailed, well thought out post, I give you a recipe for pound cake. My friend Wendy and I made this in early October (or was it late September?) At any rate, it was incredibly popular with my gluten eating friends, to the point that one of them says it’s the best pound cake he’s ever had. It’s very dense and moist, and goes beautifully with whipped cream and berries or ice cream or chocolate sauce. It doesn’t taste like the Sara Lee frozen pound cakes that I grew up on, so don’t expect that. But it does have a great pound cake crust. I snagged the recipe from The Happy Tummy.